What is Ornithine Transcarbamylase Deficiency (OTC) ? 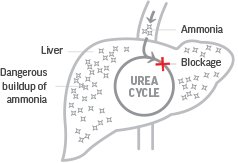 Ornithine Transcarbamylase Deficiency (OTC) is a serious and potentially life threatening metabolic disorder, under the general category of "Urea Cycle Disorders". This is a condition in which the handling of protein and its breakdown leads to a rise in Ammonia which without the appropriate treatment, can lead to significant morbidity and mortality. An infant with OTC may be lethargic or unwilling to eat, vomiting more then usual infants and have poor breathing rate or body temperature. Some babies with this disorder may experience seizures, or go into a coma. Complications from ornithine transcarbamylase deficiency may include developmental delay and intellectual disability, liver damage, skin lesions, brittle hair. In some affected individuals which is extremely likely to be girls, signs and symptoms of ornithine transcarbamylase may not appear until later in life but have a history of Vomiting, hallucinating, Lethargy, being very fussy eaters (which is them unknowingly restricting there protein) may be pale skinned and have been admitted a lot to hospital only to be sent home with a wrong diagnosis for there symptoms, many affected by Urea Cycle Disorders also have a diagnosis of autism. if the condition is undiagnosed and untreated, hyperammonemic coma or death may occur. If an undiagnosed affected women later in life has had very few symptoms it’s likely the good X as well as the Bad X is within their liver compensating but undiagnosed and untreated, hyperammonemic coma or death may still occur . On the left is a video of a little girl called Alyssa who has OTC but wasn’t diagnosed until she was 8 years old when the condition almost killed her, doctors said at the time she was going to die but she managed to survive despite the odds but sadly has been left with a catastrophic brain injury. As a baby she was in ICU for Four days with Vomiting after being born, she vomited a lot and was taken into hospital a few times, the parents were sent home and told to just syringe her water, consultants said she just had a dairy intolerance and to use soya milk to feed her with, Alyssa was delayed with speech and did echolalia around the age of 3 year, her parents were told by the consultant Alyssa was under that she had global developmental delay, she then went on to be diagnosed with Autism, Alyssa’s vomiting become far less often once she was off formula and choosing her own foods (being a very picky eater) her speech improved. On occasions Alyssa hallucinated and become almost feral, the local doctors said it was just a lack of glucose so parents gave her lucozade which seem to return her to her normal self, Alyssa was doing well until around four to five months before her brain injury, On the 4th November 2011 Alyssa got very ill, her dad had taken her to get some fish and chips when with no warning she suddenly became very floppy and was unable to walk, dad carried her to the car, drove her home and called the GP, which was closed, so we were told to go to MedOCC Quayside by the out of hours messaging system, which we did, as soon as the GP saw her he said we had to take her straight to penguin assessment and he booked her in, we went straight to the hospital. Alyssa hallucinated, become delusional and very floppy, Alyssa was admitted to Medway hospital and at first they asked us to contact her nan who had been over that day to check she had no medications that Alyssa could get into, which she didn’t and asked us if we had medicine left around, which we didn’t, then they tried to argue it was her autism, but we explained she was high functioning and nothing like this when healthy, they then said it might be meningitis/encephalitis and tried over 8 lumber punctures by the Doctor, to get spinal fluid to confirm this, but failed each time as no matter what they sedated her with she moved, this was done in the high dependency unit and she stayed in the unit for a few hours due to the sedation. Alyssa was then moved to a side room in penguin and her dad stayed with her overnight while she was on a IV being treated for suspected meningitis/encephalitis, in the early hours of the morning she woke up and was her normal self again, the doctors came and assessed her in the morning, The Doctor who assessed her said the anti viral medication should not have had enough time to work but it seems it did and because the lumber punctures tests had failed we had no way of confirming if meningitis was the cause but since she was well, he was happy to assume somehow the anti viral medication did work and because she now seemed well she was discharged home that day by him, there were no follow up appointment or other explanations to what else could have caused Alyssa being very ill and the changes in her behaviour and consciousness. Alyssa had a week off school to recover and the school put in there annual review about this admission in hospital as staff were asked by parents to monitor her once she returned to be safe, as the cause and reason could not be established because of the failed lumber punctures tests and we were still very shaken by what had happened, we also phoned up the Doctor who diagnosed Alyssa with Autism about this overnight admission to ask her to talk to the other Doctors who treated Alyssa that night as we wasn’t happy they were saying at the time of this terrible event that it was just Alyssa’s Autism, the Doctor said she would speak to them. Alyssa recovered and was back to her usual happy self, there were no concerns about her health, no more floppiness or anything, she seemed fine again. .
5 months later she got the norovirus, at first she vomited a lot but soon become delusional and very floppy and again returned to hospital, only this time she almost died, One doctor did an Ammonia blood test which come back very high so treated her for OTC, unfortunately the Ammonia had already done incredible damage to Alyssa’s brain and once in London was only given 72 hours to live. If Doctors had recognised the symptoms which as you can see Alyssa clearly showed throughout her life or Properly investigated, Alyssa would have never nearly died or suffered a terrible brain injury which has greatly impacted her life. Alyssa's Brain Injury was avoidable, when admitted Doctor's should have investigated the cause of changes in behavior and consciousness throughout her life when taken into hospital, especially when she had suspected Meningitis/ encephalitis a few months months before, liver function tests and ammonia tests should have been carried out. I think I may have Ornithine Transcarbamylase Deficiency (OTC) who do I Contact?. If you recognise any symptoms of Ornithine Transcarbamylase Deficiency (OTC] within yourself or your child you should contact your Local GP immediately for a referral to see a inherited metabolic diseases specialist. See Resources for more information. "Ornithine transcarbamylase deficiency is believed to occur in approximately 1 in every 80,000 people." Always seek medical advice from your doctor.